This has been a great month on my blog. As some of you will have already noticed, I gave my blog a big makeover at the weekend. My lovely husband, who is a great photographer, took some fab photos of my books for me to use on my blog – his photo is now my blog header and I’m over the moon with it. You can read my post about my blog makeover here. I also decided to register my blog’s domain so I now own rathertoofondofbooks.com and am really happy about that. It just cements that I’ve been blogging long enough now to know that it’s something I want to keep doing in the long term. I started using dictation software in April and this has made a massive difference to me, it means I can write blog posts even when I’m unable to type. I also learnt how to schedule my blog posts, and found some software that allows me to schedule unpublished blog posts links on social media in advance. All of this combined has made blogging so much easier for me and means I can achieve more in my day. My TBR is even more out of control than it was last month due to April bringing lots more new books my way. I’m in the middle of sorting out my enormous TBR into recent purchases/review books and then a separate TBR for books that I’ve been keeping for the right time (see my post on this here). I’m still trying to come up with a way to challenge myself to read these books because if I could stop myself waiting for the right time and just read them it would really help me clear my TBR! If anyone has any ideas for this please share in the comments below. I’m planning on making a TBR jar once I’ve finished my lists but I want a challenge to go with that. Otherwise life is same old same old really. I’m still struggling to get my pain levels under control but I do finally have an appointment to see a specialist this month so I’m really hoping that something can be done to help me. If I can get my pain better controlled and I can find a medication that doesn’t make my head feel like it’s stuffed full of cotton wool then I’ll be able to get back to reading at my normal speed and will finally be able to start making headway with my TBR. Rosy Stewart, author of Hope: Stories from a Women’s Refuge Rosy Stewart are a husband and wife writing team. They wrote a great post for my blog all about how it is to write as a duo. Heidi Perks, author of Beneath the Surface Heidi Perks wrote a brilliant guest post for me in April all about marketing a book on a limited budget. It’s a really interesting post and I recommend reading it. Sandra Nikolai, author of Fatal Whispers Sandra Nikolai wrote a great guest post for my blog all about how murder mystery writers keep one step ahead of readers. If you’re a fan of thrillers than I’m sure you will love reading this post. Also in April, I was very honoured when I was asked to guest post on Laura at 125 Pages blog as part of her first blogiverary celebrations. Laura asked me to write about how the way I approach blogging and how I’ve built my blog up. You can read the post here. So, that was my month! How was your April? Has it been a book-filled month for you? Please feel free to share in the comments below, or to leave a link to your own April Wrap-Up post. I’m linking this post up to Kimba’s Caffeinated Book Reviewer’s Sunday Blog Share. My husband had a week holiday from work this week so it’s been lovely having him home with me. We didn’t plan on doing much as it’s impossible to know how I’m going to be from one day to the next at the moment but it was nice just to have time together. My pain levels are still up and down but I finally have an appointment to see a pain specialist this month. I’m hoping that he can help me. My husband has been helping me re-design my blog this week – he’s taken some gorgeous photos of my books for me to use in my posts so I can’t wait to have a chance to use those. I’ve also registered RatherTooFondofBooks as my domain so my blog is now rathertoofondofbooks.com, which looks great and makes me smile to see it. I changed my blog to the new look last night and I’m very happy with it. It was a lot more work than I was expecting for various reasons but worth it. My monthly wrap-up post will be up either later today or tomorrow morning. 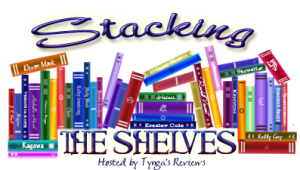 I’ll also be joining in with WWW Wednesday, Stacking the Shelves on Saturday, and my Weekly Wrap-up on Sunday.